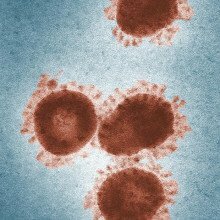 The MERS-CoV coronavirus, was in the news this week after health officials issued advice to passengers when a man from Saudi Arabia was admitted to hospital in Chicago after flying through Heathrow although he's now been discbarged. He was on a British Airways plane from Riyadh and those sitting near him were advised to contact the NHS if they felt unwell. MERS-CoV stands for Middle East Respiratory Syndrome coronavirus and it seems to be spreading from Saudi Arabia, with nearly 500 people infected so far and more than a hundred deaths. Now new research suggests that you should you steer clear of camels if you want to avoid catching it. Kat Arney caught up with virus expert Professor Wendy Barclay, from Imperial College, to get the latest. Wendy - MERS is a newly discovered virus and it's a member of a class of viruses called the corona viruses. Until just a few years ago until the early 2000s, the only corona viruses that we knew about that infected human beings caused mild colds and then around about 2003, along came a brand new corona virus called SARS which many listeners will have heard of, which of course, was a much more serious disease in humans and caused death. Now, we have this other new virus called MERS which is in the same family. So genetically speaking, it's similar to those but coming from a different place, a different geographical part of the world and obviously, causing again, much more serious respiratory infections at least in some people. Kat - What do we know about where this virus has come from? Wendy - Well originally, people thought that the virus came from bats and that may well still be the case. Bats are the group of mammals which seem to harbour many, many viruses which can occasionally be very harmful if they cross in to people. SARS, we think came from bats originally and Ebola virus, and other things that are much more familiar to listeners also come from there. Probably, the ancient precursor of MERS has come from bats. But in now seems because of the recent data that the direct origin of the viruses that have been infecting people in the middle east are camels. This MERS virus seems to be widespread in dromedary camels in places like Saudi Arabia and Oman. People seem to be catching the virus through some sort of contact with the camels. Kat - Now, this seems very strange to me. Are there any examples of people catching diseases from their camels before? Wendy - Not that I'm aware of, but I think what's very interesting is that now, we start looking at camels. The camels themselves seem to have lots of different viruses in them. The corona viruses in general seem to sit in animal species and occasionally, jump across into people. So, there are other corona viruses which have now been discovered which sit in other animals in that part of the world - in the Middle East because that's where people have been really looking recently. For example, goats and sheep are other common animals that are farmed in that part of the world and they've also got corona viruses in them. But these ones don't appear at the moment to be jumping into people. I think it's quite likely that lots of the animals that we deal with on a daily basis have got loads of viruses in them. But only rarely do they actually cross into humans. Kat - And this new virus does seem quite scary and you're saying that viruses can be harboured by all kinds of animals that we may live closely with or work with. Should we actually be concerned about this new virus outbreak? How scared should I be? Wendy - Well, at the moment, the number of cases of MERS is in the hundreds - not necessarily in the thousands yet. When we have a new virus like this, there's a combination of two things going on. One is that the virus itself perhaps is being able to jump into humans more frequently but another is that the harder people look, the more they find it as well. So, we have to be careful not to assume straight away that everything has completely changed. It might just be that we're picking these up, now that we're looking. But we must emphasise that so far, this virus is jumping across from camels into humans but isn't really passing from one person to another very efficiently. Although there is some human to human transmission, that isn't what we would call self-sustaining. So at the moment, this virus isn't about to cause a pandemic because we need sustained human to human transmission for that to happen. On the other hand, in some individuals, the MERS virus has been very serious, but many of those people who suffered the worst cases are people who've already got something else wrong with them. They've got what we call comorbidities - health problems, perhaps an immune system that isn't working properly or they're rather elderly and frail and not able to cope with this virus. In healthier people, the viruses only caused much milder disease. At the moment, we should watch very carefully what's going on. Keep a check because viruses can mutate and can change their characters. But I don't think this is about to break into a pandemic tomorrow. Ramsey Faragher has been to Google’s headquarters to play with “Tango”, a next generation smartphone that comes with a built-in laser! 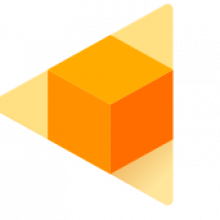 Ramsey - I got my hands on their project Tango, which is their brand-new prototype smartphone. It's everything you expect in a current smartphone, except it also contains a 3D laser scanner, 3 different cameras and 2 dedicated image processing chips. So, it can literally see and sense and map and image the world around it better than humans can. Chris - What does it look like Ramsey? Ramsey - Well, it looks like a normal smartphone. It's a little bit heavier and a little bit thicker. I think it's got slightly larger batteries because of all of the power consumption. Chris - So, on the back of the phone where we would normally have just that one eye of a camera, there are two are there? Ramsey - There's 3 things you notice - it has the normal camera you see and there's a source for a laser beam because it sprays infrared laser in order to detect the distance to objects. And then there's a special fish-eye infrared lens that picks all of that infrared laser light back up and measures which angle and direction it all came back from. Chris - So, what's the point of this? How would I use it or how is it going to change my life? Ramsey - Google have made 200 of these devices and given them to developers in order for people to start playing with them and start doing cool stuff. A lot of the things that I saw a couple of days ago, it was all augmented-reality games and augmented-reality applications. So because Tango can see the environment and it knows the distances and positions of all the objects in the scene, it can overlay information on the camera screen to change what you see of the world. So, for example, I was chasing a cartoon bunny around the Google offices. I could see this little rabbit, and it could hide behind furniture, it could jump up onto objects in the environment even though it's just this virtual cartoon bunny. I think a big part of this will be playing computer games with people outside in the real world and interacting with the environment. Chris - Could something like this be used to overlay anatomical information or a readout on the surface of the patient so the surgeon knows more precisely where that blood vessel is on the patient? Ramsey - The kind of technology they're using, this laser-based camera technique, it will be able to overlay information on the real world to within a few millimetres back you see. So, you can see lots of applications for educational purposes and life-saving purposes. You can see a future where instead of people going on YouTube to look at how to fix their car engine and having to memorise it all, you can stand there, hold your phone and look at your car engine. And it will all be shown to you on the screen - what you need to do, what you need to lift, what you need to change, and so on. Chris - And there's no danger with you going around zapping people with lasers flying out the back of your phone? Ramsey - It's low-power infrared light that's being generated. It's actually a technology called structured light that projects a certain pattern of spots onto the world and if you are projecting onto a perfect flat wall, it knows exactly what those spots should look like. But, if there's objects in the way, the spots effectively move and the camera looks for these displaced spots and works out that there's an object in the way. So, it's eye-safe. It's not going to blind people. Chris - Now, you're out in California, not just to go and see what Google are up to, but to go to a navigation conference. So, what's doing the rounds at the conference? Ramsey - I'm sure everyone is familiar with how much the USA uses drones - not only in military operations but this growing use of autonomous aerial vehicles for domestic purposes as well. I'm sure we all remember the new story about the Amazon delivery drone back in December. The Federation Aviation Authority, the FAA over here has been trying to crack down on this commercial use. Chris - Why is the FAA trying to stop people doing this, people have been building their own homemade aircraft for donkey's years? What's wrong with that? The Royal College of Physicians have issued a report looking at the standard of asthma care in the UK. There are over 5 million asthmatics in Britain, and last year there were more than 1000 deaths from the condition, one of the highest rates in Europe. Medical staff, the report says, need to be better trained to recognise the symptoms of the disease. - Asthma affects the small airways, or bronchioles, which carry air in and out of the lungs, causing wheezing, difficulty breathing, and in serious cases, death. - When an asthma sufferer comes into contact with something that irritates their lungs, the muscles in the airways contract, causing the airways to narrow, making it hard to breathe. - The lining of the airways also becomes inflamed, leading to a build up of sticky mucus, making breathing even harder. - Most people have triggers for their asthma including cold air, or things they are allergic to. In some cases anxiety - and even laughter - can trigger an attack. - Some people think that asthma has become more common as our lives have become more hygienic. Childhood exposure to bacteria and viruses may help the immune system recognise what is dangerous, and what isn't. Without this it can over-react to harmless triggers, causing asthma and allergies. - However this isn't the whole story- pollutants in the environments, and being exposed to cigarette smoke can also increase your chances of developing asthma. - There is currently no cure, although it can be managed using a combination of drugs and lifestyle changes, such as taking regular exercise and avoiding triggers. 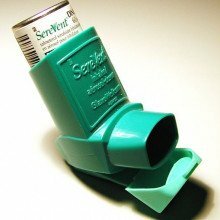 - Drugs prescribed for asthma are delivered via inhalers. There are two main type- relievers and preventative inhalers. - Relievers contain bronchodilators which widen the airways, and are taken when symptoms are felt. They are usually quick to work, but short acting, although longer acting ones are available. - Preventative inhalers should be used daily. They usually contain steroids, which reduce inflammation in the airways. They don't work immediately, but build up over time to reduce symptoms. - Asthma attacks normally occur after a gradual worsening of symptoms over a few days- so any changes should never be ignored. - If you are with someone who is having an asthma attack, you should help them to take 2 puffs of their inhaler, followed by slow deep breaths. Repeat every 2 minutes, until they have had 10 puffs. If they don't start to feel better, call an ambulance. 14:35 - Should Pfizer takeover AstraZeneca? Why are US company Pfizer so interested in acquiring the UK pharmaceutical giant AstraZeneca, and is it a bad thing for Britain if they do? The present take-over bid from the US company Pfizer values the UK pharmaceutical giant AstraZeneca at over 60 billion Pounds. So far, Astrazeneca's board have rejected Pfizer's offer, and politicians and commentators are expressing alarm at what a merger between the two companies might mean for British jobs and British tax revenues. But why are Pfizer so interested in acquiring AstraZeneca, and is it such a bad thing for Britain if they do? George - For the last 50 or so years post-war, we've been able to rely on the pharmaceutical industry to bring us every year new drugs, new treatments, new devices, a constant stream of extraordinary medical innovations. Even 20, 30 years ago, cancer was a death sentence. 98% of women now survive breast cancer. So, extraordinary advances but we have a problem in the pharmaceutical sector worldwide. The cost and time of developing new medicines got too long and too high. They can't afford to develop new medicines for us. 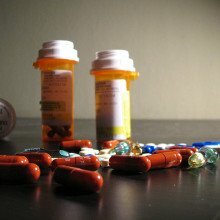 We in the west can't afford anymore to buy these incredibly expensive new medicines. And, increasingly, what we have realised is the more we know that disease, and the more we know about genetics, actually, what was yesterday the blockbuster drug that we wanted, today isn't. What we need now are targeted and personalised medicines. The more scientists are unlocking the science to understand it, it's actually breaking the market. So, the whole model is changing and the big pharmaceutical industry's companies are really having to reinvent themselves. Today, it's all about working in hospitals with patients, with charities, looking at patients who've actually got disease and designing drugs for the patients who really need them. For too long, we've been buying drugs that the industry promises will work in everybody. And actually, in order for them to be safe in everybody, they're not working effectively in every patient. We're wasting a lot of money giving the wrong drugs to the wrong people. Chris - So, how will this proposed merger between Pfizer and AstraZeneca deliver a solution to that problem? George - This merger is actually driven by this dynamic. Here in the UK, we set out 3 years ago - the Prime Minister set out - a groundbreaking 10-year life science strategy to make Britain the best place in the world to develop modern medicines. AstraZeneca, last year, in a stunning announcement, completely reinvented the way they work as a company. They closed down their old factories and are moving to Cambridge, England, to embed themselves in the extraordinary cluster of hospital, university and little companies. Pfizer, in many ways, have been the poster child for what the industry have been doing for the last few decades - buying up other companies - in the quest to continue to deliver profits. But all these industries, all these companies, have got a basic problem: that their pipeline of new drugs is getting weaker. And so, when Pfizer announced that they're buying AstraZeneca, it's an extraordinary moment. And the question in the industry is, is this Pfizer buying the AstraZeneca model of 21st century drug design, or is this the last gasp if you like of the old model of a pharmaceutical company buying the other one out to diguise their underlying weakness in their pipelines? Chris - The cynics could say, George, that why doesn't Pfizer just reinvent itself the way that AstraZeneca have then if it's so successful? George - That's a really interesting question. Many people in the industry and many people within Pfizer are very excited by the fact that Pfizer are buying into this UK model of hospital-based and 21st Century medicines-design through acquiring AstraZeneca. And so there's a really interesting question here, I think, for the UK. I think we ought to be neutral about who owns these companies. The question is, is the research being done in the UK, are British patients going to benefit, are British patients going to start getting access for new medicines again? There's a parallel here with the automotive industry. Through the crisis in the '70s, the British car industry has reinvented itself through Formula 1, high end components and supply chain. We've now become a net exporter of cars again. Now the companies making those cars are largely foreign-owned, but the employment, the R&D, the technology, the assembly, the factories, the jobs are here in Britain. There's a similar thing going on in the pharmaceutical industry. I think we should be focusing on the level of commitment that companies like Pfizer and AZ are making to R&D are not worrisome actually about the ownership. The truth is these are global companies with global investor shareholder basis, global management. They're international businesses. The key is on the investing area in Britain in research for the benefit of British patients. What we should be doing, I think, is saying to Pfizer and indeed to AstraZeneca, "We will sign with you a 10-year research agreement. We, the UK government, all the agencies involved here will sign a 10-year research agreement. They're very standard in the industry in which we make a series of reciprocal commitments to you and you to us. Will commit to all the things we set out in our strategy to adopt innovative medicines more quickly, fast tracking of clinical trials, quicker recruitments of patients, less bureaucracy, more access to working with doctors and patients in the NHS through the National Institute for Health Research. If you listen to the Naked Scientists on a radio over medium wave, the transmissions you're tuning in to might be interfering with the migration patterns of nearby birds, according to research from Germany. A team there were studying the direction that robins set off on their migration journeys by putting the birds in small funnels, called orientation cages, in darkened huts. But something was wrong, as the birds didn't seem to know where to go - until they tried screening out electromagnetic radiation - or radio waves - from the huts, by surrounding them with a shielding device called a Faraday cage. Kat Arney spoke to lead researcher Henrik Mouritsen. Henrik - For the 2 to 3 years, we couldn't get the birds to orient in these orientation cages that we used to test their behavioural preferences. And that's very strange because that experiment has worked all over the world for about 40 years. Any time we tried them for a descent amount of time, they would basically just one day jumping in the direction, the next day jumping in that direction, and that's not what you would normally expect. The birds show migratory restlessness and it's directed in a direction in which they want to fly. So normally, they should jump to the northeast in spring and the southwest in autumn, but they didn't do it. Kat - So, what gave you a clue that there was something maybe interfering with the bird's migration system? Henrik - Well, it was obvious that there was something we were doing wrong because I had done the same experiments in Denmark during my doctoral thesis and there, those experiments worked fine. So, we tried all kinds of things. We changed the food, we changed the cages, we changed the light in the room. We changed a lot of different things and nothing seem to help until one day, a post doc of mine got the idea that maybe we should try to screen it like do the Faraday cage around our setup so that electromagnetic noise was screened. Honestly, I didn't think the likelihood that this would make any difference was very large, but by that time, we were willing to try almost anything to get these birds to show their natural behaviour. Kat - And so, once you started screening out the electromagnetic fields, what did you start to see? Henrik - The birds started to orient just as they were supposed to do with what they had done in my experiments in Denmark. I was like, "Really?" That was very unexpected and anyway, I was happy because we could start doing those experiments that we had wanted to do all the time. So, that's what we did first. We focused on doing the experiments we have been planning all the time. it was also immediately clear to me that if the improved orientation was really due to the screening of the electromagnetic noise then that was a very important finding in its own right. So, a year later, we tested that more directly by just thinking about the prediction that a Faraday cage only works when it's grounded. Basically, if you disconnect the grounding of the Faraday cage then it doesn't screen anymore. So, we basically did the simple experiments of disconnecting or connecting the grounding without the students doing the experiments knowing that we were doing it. And suddenly, it became clear that on the days when they were tested ungrounded that they were random and on the days they were grounded, they were oriented very fine. Kat - Were there any particular frequencies that you found were interfering with the birds? Henrik - We see an effect of frequencies ranging from about 50 kilohertz up to about 5 megahertz when we can be sure that it's not the power lines for instance because the frequency of power lines is typically 16.7 hertz or 50 hertz, or much, much lower frequency. We can also say that it's not mobile phones because mobile phone communication takes place in gigahertz range so billions of hertz. So basically, it's middle wave radio. Kat - What do you think are the implications of this if sort of radio signal produced by regular radios, all kinds of electronic devices interfering with some birds migration? Henrik - Well, they only do so very close to the source. So, the birds seems to have only a problem in urban areas, not in rural areas. It could also be a more serious problem if for instance, the birds determine their flight direction prior to takeoff and then they keep that direction for a full night then they would fly wrong for a full night if they were sitting in an urban area in case it's overcast because birds have more than one compass. They have a magnetic compass, a star compass and a sun compass. As long as they get good information from one of them, they are generally okay finding their right migratory direction. So, I don't know how big this effect would be on wild birds, but I'm pretty sure the birds would find it better if they could use all their navigation systems at all locations at all times. 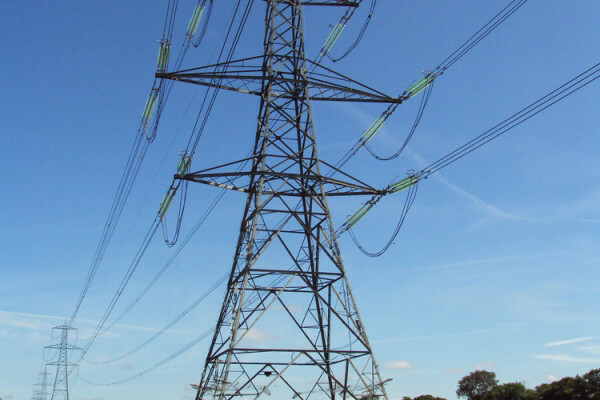 sFor over 80 years, homes in the UK other industrialised countries have been powered using a national grid system. This means that power stations all around the country can share the load and if one of them breaks down, the others take up the slack. 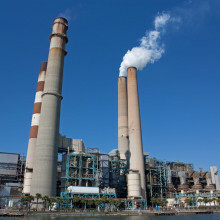 And because our patterns of energy use are quite easy to predict, it's been a relatively easy task to turn power stations on and off in anticipation of when we will need them. One way to deal with this is to invent a new "smart" national grid system that controls how we use power according to how much is available. Guenter - We've done this experiment for 80 years. We can fairly well forecast what the demand will be the next hour, 5 hours from now or tomorrow. However, there's new technologies that come into play that change that now. If you now put a solar panel on your rooftop, what happens on a day when we have intermittent clouds moving through the area? In essence, your net consumption changes from almost minute to minute to second to second. And so, those fluctuations are very different than what we've observed for the last 70, 80 years. So, we have to be able to handle that and manage that. Chris - Is it the dream that the grid will become switchable? It would direct energy into different places at different times in order to make it reactive. Guenter - Very much so. But we're trying essentially to convert the grid from a flip phone to a Smartphone. And so, with that smarter grid, we can react to unanticipated changes. We can accommodate those changes much more rapidly. Chris - So, the obvious question is, what's stopping you? Guenter - Some of the technologies are available. It's just a matter of implementing those technologies and advancing some of the technologies. 4% of our electricity comes from wind power. If we're going to go 20, 30, 40% wind power that fluctuates all the time then we need to do better than what we do now. Chris - At the moment, a lot of these smart metering technologies in people's own homes, it's telling them where they're using the power and encouraging them led by price to change their behaviour. But to do what you're saying would involve the power station or the grid itself sending a signal to my house to say, "Right, the grid is under heavy load at the moment. Have you got some systems running that actually, you probably could turn off for 10 minutes or so to give the grid a bit of a rest?" That's a bit different though isn't it? Guenter - That technology exists. I have one of those meters. I've had it for the last 5 years and I get messages every day when the grid gets strained. Meaning, that translates to a higher price. My phone tells me, now will be a good time to turn something off. Now, that still depends on me then making a decision and actually, actively doing something. So, we want to move away from that. so for example, if your refrigerator gets turned off for 2 minutes, you won't notice the difference whatsoever. The food will still be cold. So, what we want to do is we want to get to a situation where it's fully automated and your appliances do this all in the background without you, even have to worry about it. Chris - It is not a problem with that though that if the grid goes under load, lots of things turn themselves off all at once and altogether in synchrony and then you get a huge surge and everything goes, "Ooh! There's a big surfeit of power!" Everything turns itself back on again and the whole grid goes to these horrible cycles of boom and bust which ultimately puts enormous load on the technology. Guenter - Good point. The Germans have realised this with the solar PV panels where all the solar PVs, small scale intallations, all on people's rooftops had a controlled signal built-in that said, if the grid is strained to a certain point, at that point, turn it off. And if you had a million of those and if that were to happen, a million of them turning off at the same time, the grid would collapse. It couldn't handle that because this would happen within a fraction of a second. So, one research area clearly is to develop control theories and control algorithms and underlying technology to move to something where we have not just one controller but we have millions of them. They talk to each other. They're sensitive to what the others are doing. Then we can avoid these problems. Chris - Have we got a grid to practice on? Guenter - You don't want to do these experiments on a large scale. So, we build these, we test them in the laboratory and then we try to validate them on a computer too. Eventually, we'll move them out to small scale real grids. And so, right now, we don't do this but you can envision that we work with the Argonne on-site grid. You usually don't experiment with a real system that has millions of customers on it until you're really, really sure the thing works the way it's designed to. Chris - And how far do you think we are from that dream? Guenter - We sort of have a 5 to 10-year outlook so that we develop the tools, the control tools, the modelling tools in the first 5 and then in the second 5-year period, that we actually would deploy them and roll them out and test them. Chris - Do you envisage any problems with retrofitting this into people's homes? Is that going to be a huge cost of implementation? Guenter - One of the criterias that we always include when we make a plan is, clean, reliable, resilient, but also, affordable because that is the key thing. It's key thing to you as a consumer - you and your household as well as to industry. The increased use of renewable technologies means that energy availability will fluctuate more. To counter this, a number of so called "energy sponge technologies" are being developed which can soak up excess any energy from the the grid, and then "wring" it back out when less is available. James Mcnaughten is the CEO of Isentropic, a company looking to store surplus electricity as a temperature difference. Kat - So, can you start by explaining to me basically, how does your technique work? James - The technology works by what we call a thermomechanical process where we take electricity and we use it to drive a machine - a heat engine - which creates a supply of hot and cold. We store the hot and the cold and then when you want your electricity back, you take your hot and cold, and you run it back through the heat engine, and this generates electricity which you feed back into the grid. Kat - What can you store this heat in? I mean, in a jar? Where do you store it? James - So, we've spent several years developing what we call thermal stores. They're very large devices and they're really quite sophisticated. But the critical point is that we use a very simple natural material which is crushed rock as the actual media within these thermal stores to store the heat and to store the cold. Kat - So basically, you've got hot gravel and you got cold gravel. James - That's exactly right. Kat - It sounds so simple. 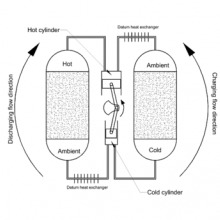 So, when you're taking the temperature difference between your hot gravel and your cold gravel and turning it back into energy, is this actually an efficient process because I know with things like the hydroelectric storage where they let water run down and then pump it back up so you can let it run down and generate energy when you need it, they're not terribly efficient? James - I think in terms of efficiencies, it's often sort slightly misunderstood. With pumped hydro, they have roughly 75% rounds trip efficiency. So, for every 4 units of energy you put into them, you get about 3 out. And that's an inevitability when you have real physical processes going on and we're no different. But the critical point about energy storage is that, it allows you to move electricity from a time of day when you don't need it, to a time of day when you need it. Effectually, it reduces the waste on the system. Kat - I think because that's obviously the problem as we've discussed. You can't just suddenly turn everything on, turn it off. But how quickly can you flip this process around from storing electricity to releasing it back out when everyone needs to put the kettle on during Corrie? James - Well, our system is very fst. We can go from full charging to full discharging in less than a second. We spent a lot of time making sure that it would be able respond on a very quick basis because that's really what we see the market needing. If you have cloud cover going over and you imagine a big solar farm, you suddenly see a very rapid drop in power generation. Likewise, with gusty conditions around wind farms, you can see very rapid changes in power output over short periods of time. Kat - So, this sounds like a great idea - you've got a technology that works, it's quite efficient, it's really fast. The big question is, how close is it? How close are you to making this reality that could be plugged into our greed? James - So at the moment, we're building our first commercial scale system in our factory where we based in Fareham in Hampshire. 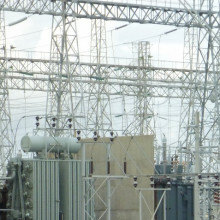 We also have a contract to build a larger system to go on to a UK substation that should be operating in 2017. In terms of the time to roll out, it'll several years beyond that before you're able sell at large scale. So really, from where we are now to being in a sort of the ability to just apply commercially, you're talking about 5 or 6 years. Kat - What sort of thing are we talking about in terms of size? I mean, I'm imagining - Chris has said to me a gravel of pit! 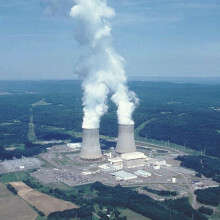 What kind of size would these units be sitting next to a substation? James - If you took a 20 by 40-meter industrial building, that would supply - basically be able to store enough electricity to supply a small town. So, 2000 homes to give you a sort of feel for the scale of it. We can obviously make them smaller, but that is the sort of - I think the maximum size would expect them to be built in any one installation. Kat - And just very briefly, I mean, this is obviously a very exciting technology. Are you hopeful now that people are really starting to change the way we think about storing energy? Are you positive that this could be the way to do it in the future? James - We see massive changes in the market even in the last year and it's been driven so that this is a sort of global change in interest. People have seen how far the price of solar panels have fallen over the last 4 years and you now have the situation where in large parts of the world, people can install solar PV without any subsidy at all. And actually, save themselves money. We see this phenomenon going. To manage this large amount of solar and in countries that are less sunny but windy wind, what you're seeing is people looking for solutions like energy storage because if you don't have energy storage, you end needing to have far greater number of power stations just sitting idle waiting for when the wind drops or the sun goes in. Energy storage effectively allows you to reduce that number of power stations and to waste less electricity. Technology company ABB are working on developing high voltage systems, which they think could transport power further and more efficiently. So we can improve the grid, but with added fluctuations from more renewable energy being used, we have to make sure that our power networks work efficiently to predict and manage energy use. Mathmatician Peter Grindrod from Oxford University is working on a pilot scheme in Bracknell in Berkshire to examine how we can improve the networks effectiveness. Kat - So, can you basically very briefly explain what is the current problem with how our network is working. Peter - Well, we're working on a project with Scottish and Southern Energy Power Distribution who own the network or distribute energy through towns like Bracknell in the south of England. The problem that we've got is that people are going to be putting more and more technology, more and more demand, and more and more generation onto the network. So, the old wires that were put in there for one thing and they're going to have to be used in a much more flexible way. We're particularly thinking about low voltage networks. So, that's the last mile if you like from the substation to your house. And on such networks, there aren't lots and lots of customers that might be 100 houses on a network. So, when we look at their profile, it's not smooth at all. Every time somebody produces a demand like turning their dishwasher on or their kettle, actually, that produces spikes. Now this is an opportunity really because over the next few years, we're all going to get smart meters put into our homes. So for the first time, we'll have some idea of the different patterns of use by different households. When we look at such patterns in typical residential areas, we find that some people are very volatile and some people are very predictable and do the same thing every day. Well, if you've got some means of storage and we've heard about some storage with hot and cold gravel, or you've got just a hot tank of water in your home. If you've got some means of storing energy then you'll be able to take advantage of that situation because it's likely that the price of energy will vary during the day. And now, you're able to monitor or rather just a smart meter is able to monitor your usage, actually, what it can do is take energy out when it's cheap and then give you that energy back. But it must do so, just as we heard from Argonne, from Guenter, it must do so in a way that we have a passive customer. We can't have everybody worrying about when they're going to use energy, when they're going to turn the cooker on. Kat - I was going to say you know, I'm coming home from work in half an hour. Once I've done the radio show, I want to turn the cooker on. It needs to know that I'm coming home. So, how can the kind of stuff that you're working on, how can maths help to predict this kind of demand? Peter - So, that's quite challenging. It's a really good example of modern maths actually. What we do is we want to write algorithms that monitor what you do from day to day and from week to week and gradually, that chip which sits in your home nice and securely will learn what you do. And so, it will automatically take care of those predictions of high spikes and those predictions of times when you're using less energy. Really, the problem for maths is that we don't want a sort of medium forecast. We want to predict where the spikes are going to become, how big they're going to be and in particular, we'd like to predict them slightly early so that then we can control any storage or any other devices we've got on the network. Kat - But I guess the challenge is, I for example don't do this radio show every week. So, how do you guess that I'm not going to use the cooker at half past seven? Peter - Well, so some of your demands will be fairly fixed. A lot of people have to catch a school bus in the morning and some of your demands will be extremely discretionary and won't be fixed. But actually, quite a lot of usage is predictable. The difficulty is that you're getting in on living your life. So, we have this notion in Bracknell of looking at lots of domestic users, trying to figure out how many of them are so volatile that no amount of forecasting and no amount of energy storage or time shifting demand shifting would be useful. And how many customers and how many substations are going to be able to deal with this in a very profitable way. It's a kind of win-win really. Kat - So, I was going to ask about the Bracknell projects. I mean, why Bracknell? I used to live there and how does it work? What are you actually doing? Peter - Okay, well we chose Bracknell because it's got a bit of everything. It's not a space tent like Milton Keynes or something like that. It's got lots of house in the states and it's got some older properties which are sort of mixed or what we say heterogeneous. They've got a mixture of small retail and housing. Another of course, it's also got some big business parks, many companies that part of our project have their headquarters there. So, we chose it because it had lots of typical areas. And so, that we could meter up some residents. Of course, eventually everybody will get a smart meter in the UK, but what we've done is intensively meter up some residences so that we could have a look at how many substations, how many local networks are in trouble and might need smart management. And of course, there'll be others that aren't in trouble at all. They've got lots of capacity. At the moment, we don't monitor those so we don't really know. Of course, at the same time, people are getting electric vehicles, they're getting solar power, they may be getting heat pumps. But there's going to be new technology invented over the next 5 to 10 years which we haven't thought of yet. And all of that is going to have to go on these low voltage networks and kind of domestic consumers. They're just going to expect it all to work seamlessly. So, what we want to do is to put a sort of smart layer in that helps them do that. 50:29 - What is fire and how does it burn? What is fire and how does it burn? Hannah - So, what is fire and why does it burn? We ignite the issue with professor of chemistry and fire science, Richard Hull from the University of Central Lancashire. Richard - Imagine gas coming out of the cooker or from a cigarette lighter. The gas mixes with air, but nothing happens. But the small spark sets off a chain reaction, resulting straight away in a hot flame. What causes, this huge difference? The spark's got enough energy to break a few molecules into pieces: we call them free radicals, which react billions of times faster than the fuel and air gas molecules. When they react, they give out lots of heat and light, producing a flame. That flame can produce more radicals and spread to other things, starting a fire. 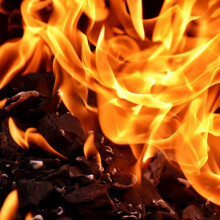 When a solid - like wood - is heated, maybe with a flame, some of it turns to gaseous fuel, which mixes with air and, like the lighter, it too starts to burn. Fire is incredibly important. Being able to control it opened the door to cooking, the Bronze Age, the Iron Age, almost all forms of power generation and most atmospheric pollution. Hannah - Thanks, Richard and as long as there's oxygen, fuel and heat, a fire, once ignited, can burn indefinitely. The world record for the longest burning fire is a bed of coal 30 metres underground beneath Mt. Wingen in New South Wales, Australia. And it's still smouldering, thought to be ignited by a lightning strike hitting the top of the coal over 5,000 years ago! How can photons impart momentum to objects? Next What is fire and how does it burn?